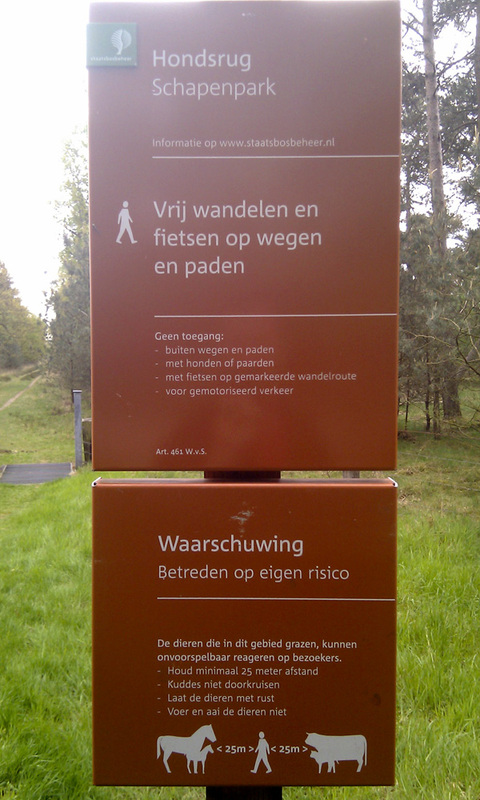 This afternoon I was in the northeastern corner of the Netherlands to activate one of the most wanted PAFFs. There are a number of parks that have only been contacted by a handful of OMs in the northeast. On special request I focused on PAFF-046 (Odoorn Boswachterij) - number 2 on the most wanted list. The weather was very good today allowing me to operate partily outside - the last time I was able to do that was in October last year (PAFF-042). 10m seemed very quiet so I started on 15m. There was quite some QSB. I worked some 24 stations before going down to 20m where I worked 66 stations. 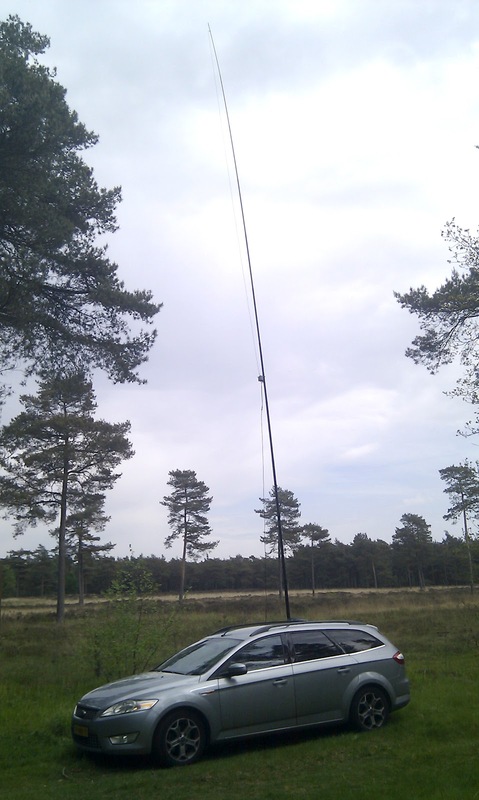 Then I went back up to 17m to check for some more DX. 17m is never very busy so after 11 contacts I went down to 40m for short distance contacts. 40m was rather busy - I only found a quiet spot near the end of the band. I worked 32 stations before I had to pack up and head home. With the weather and surroundings being as pleasant as they were I took my time changing antennas and chatting to a curious passerby (who turned out to listen to local 80m ham rounds). Out of the 2,5 hours I was in the park I was active for about 100 minutes. In this period I confirmed 133 contacts with OMs from 31 DXCCs. Maximum QRG was set by an N4 OM in North Carolina to 6700km. 25% of the contacts were first time contacts. Manuel EA2DT, Alexander RV9UCN and Yuri RZ9OC came by on two bands. Luciano I5FLN came by on three bands in between eating his birthday cake. Thanks all for giving me a report. After talking to Paul, MM0ZBH at the beginning of this year I became interested in a yagi he uses in a portable setup. I cannot put up a large antenna at my home QTH, so I am frequently working /P with my tried and trusted end fed verticals. A 4 element yagi however is in a different league. The yagi Paul uses is a 4 element lightweight (6kg) yagi originally built for 11m. However, with minor changes it is very usable on 10m as well. Paul told me about the results he got with the antenna and that it was easy to use /P. I was intrigued as my yagi reference is a 10 element 2m yagi that I have used in the past. It is still lying in my garage but I would not consider it a very portable antenna (bulky even disassembled, heavy and takes quite a bit of time to assemble). After a disappointing /P afternoon this week when I did not manage to break any of the pileups that I encountered, I decided to buy the yagi. 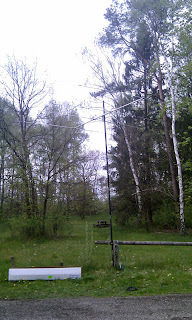 The yagi is known as Sirio SY27-4 and sells for around 130 euro's. I picked it up today, assembled it (very simple) and did a little testing using a couple of fibre glass extension tubes of my Spieth mast to support the yagi (they actually carried the yagi quite well to my surprise). I was careful not to push my luck so the mast was not too high. I guess the antenna was at a little under half a wave length (<5m / <15ft) high. I configured the antenna (elements and gamma match) roughly according to Paul's specs and found that the SWR was flat over 28.3 - 28.5 Mhz (not even one segment on my FT857 SWR meter). So bandwidth is not an issue with this antenna. You can find more data about the antenna performance on my projects page. The disappointment came when I found out that 10m had already gone dead. In the phone segment I could hear one whisper and white noise, all below S1. On the PSK frequency (28.120) I heard a faint signal and on the cluster I saw some activity in South America. I decided to hook up my MicroHam interface and I turned the beam towards SA. After calling a few times I was greeted by an Ukrainian OM who was /MM in the South Atlantic sea, south of St Helena (8700km) and by a CX OM (11.500km). Both gave me 599. This is promising as they are not my every day type of contact and the band was really in a terrible shape. Now I have to find some /P operating time at the right moment when 10m is open.